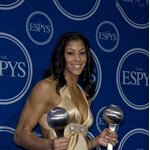 Candace Nicole Parker (born April 19, 1986 in St. Louis, Missouri) is an All American basketball player for the WNBA's Los Angeles Sparks. She was drafted to the team from Tennessee in 2008. She may be best known for being the first woman to dunk in an NCAA tournament game and the first woman to dunk twice in a college game —she set both milestones as a redshirt freshman on March 19, 2006. She also became only the second player to dunk in a WNBA game on June 22, 2008. A uniquely versatile player, she is mainly a forward, but was listed on Tennessee's roster as a forward, center, and guard. She was a starter on the Lady Vols basketball team, winners of the 2007 and 2008 NCAA championships. Parker's brother Anthony Parker plays for the NBA's Toronto Raptors. 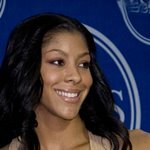 Candace Parker announced her engagement to Shelden Williams, who was a college basketball star for Duke University and currently plays for the Sacramento Kings of the NBA.